This brandied peaches recipe is infused with vanilla bean, sugar, and good-quality brandy. It makes a wonderful topping for pancakes, ice cream or as is with a dollop of clotted cream for dessert. Brandied peaches require three months of aging before serving, so plan accordingly. It's worth the wait! And peaches are at their best and most abundant in August so that they would be ready in time for November and December holiday desserts. They also make a wonderful edible gift. Sterilize 2 1-quart jars and lids by boiling in water for 2 minutes. Let air dry on a clean, lint-free dish towel and set aside until needed. Use a small, sharp knife to cut a small X shape at the base of each peach. Place peaches in a large, deep heatproof bowl and cover with boiling water. Allow peaches to sit for 2 to 3 minutes. Using tongs, transfer one peach to a plate. Try to peel the skin off. If it comes off easily, then drain and peel the remaining peaches. If not, let them sit in the boiling water for a further minute or so. Peel the peaches and cut in half and remove the pits. Cut each half into 4 pieces, so each peach yields 8 slices. Arrange peaches in layers in the jars alternating layers of caster sugar. Place half of a split vanilla bean down the side of each jar. Pour over the brandy making sure the peaches are completely covered. Seal tightly then shake gently to help dissolve the sugar. Place jars in a cool, dark place for 3 months. Make sure you shake the jar gently once a week. 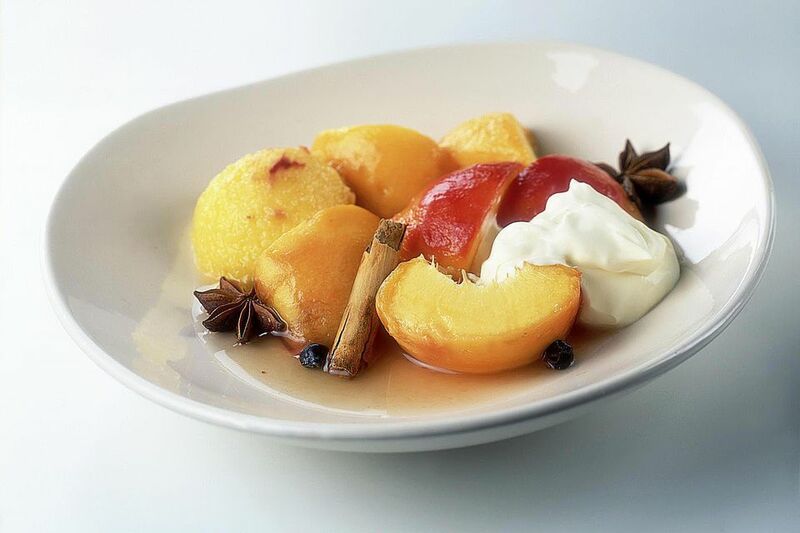 After 3 months serve brandied peaches with pancakes, ice cream or enjoy with a dollop of clotted cream for dessert.